Once a promising baseball player, Troy (Washington) is haunted by resentment at the racist treatment that has left him earning a living as a garbage collector. Although he’s often charming, Troy’s tight grip over his family has deepening consequences. While Washington is excellent in this adaptation of August Wilson’s play, Viola Davis’s stunning performance as wife Rose has earned the Best Supporting Actress Academy Award. Following a week featuring five different films at the David Lean, we have six in the week ahead! We start with a repeat of the Academy Award nominated black comedy Toni Erdmann tomorrow evening – seats are available. Please note the early start time of 19:00. Tuesday evening brings Certain Women; a film “as elegant and graceful as the vast Montana landscape” (Detroit News). 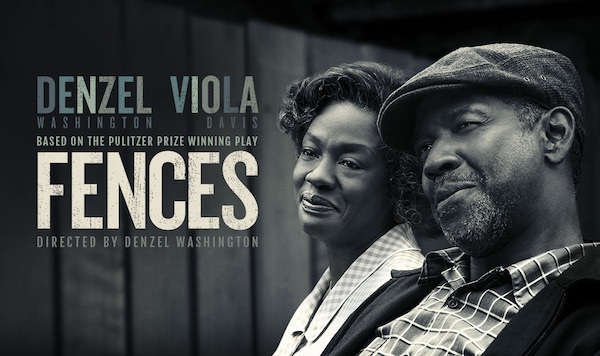 Seats are available for the Thursday afternoon screening of Fences starring Denzel Washington, but very few are left for the evening one. This adaptation of August Wilson’s play features a stunning performance from Viola Davis which earned her the Best Supporting Actress Award at this year’s Oscars. Read More…..
Moonlight has won Best Motion Picture at the 89th Academy Awards ceremony. But amid much embarrassment and consternation as La La Land was mistakenly announced as the winner! But ‘all publicity is good publicity’ as they say and the general tone of the Oscars was one of hope and optimism for the film industry. In case any one has missed the extensive media coverage and results, here’s a brief summary of some of those who took home that coveted golden statuette: Read More……..